Tony was working last night. I'm used to having him be gone at night - I don't get as easily spooked as I used to, and I kind of like being able to steal the covers without anyone getting mad. Ramon's been sleeping in Leila's room, so that leaves the big old bed to just myself and Sugar. Ahhhh! Well, lately there have been a lot of racoons outside during the night, making noise and bothering my dogs. Usually Tony deals with it, and gets the dogs to chill. Last night, however it was only me. 3am....Ramon starts barking like crazy - I run into Leila's room, grab him, put my hand over his snout and make sure he didn't wake her up. Phew, he didn't. I bring him back to my room. Then Sugar starts going nuts. I start hearing things. Is someone trying to break in? Quietly open my door....silence. Except for Ramon who is trying his hardest to bark while I still have my hands around his mouth. Check the alarm - still on. Check on both girls - still sleeping peacefully. But at this point I'm wide awake and going through terrible scenarios, because I've watched way too many horror movies and Dateline specials. Ugh. I decide that if someone is out there I'll turn on my bedroom light so they know I'm onto them. Ten minutes of silence goes by. I decide to turn on the tv. 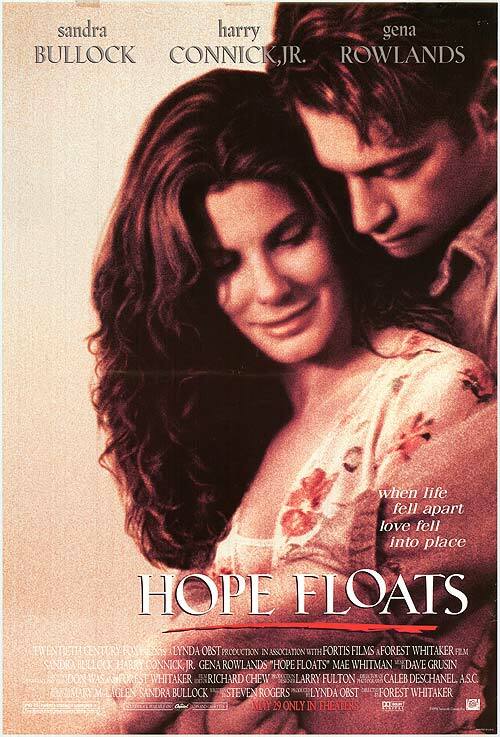 "Hope Floats" is on. Awh.....I love Harry Conick Jr! Lucky for me it just started.....so I watch the whole thing, with the lights on at 5am. Oops - it's 5am. I turn off the lights and try to go back to bed. It's not happening. I turn the tv back on around 5:20 and "Legally Blonde" is on - score! I watch the majority of it and drift off to sleep...only what seems like seconds later to have my 7:15 alarm go off. Start the pot of coffee, start the day. After dropping Leila off at summer camp I got my Starbucks with an add-shot. But now it's naptime. There are rooms to be cleaned, dishes to be put away, orders to be filled, the Fourth of July menu to make and so much more, but I think while the girls sleep I'll treat myself to a nap. You are tougher than me. As I read this post, I kept looking over my shoulder...I am such a wuss. Also, B asked if I minded if he worked some OT and gave me some possible times. I told him any shift, besides the overnight one was okay. Nights alone scare me to death! hooray for extra coffee shots and naps! Oh boy, hopefully you did get a nap - you deserve it! Did you ever take your nap?